Because even relatively minor excavation activities like landscaping or fencing can cause damage to a pipeline, its protective casing, and/or buried utility lines, always contact your state's One-Call Center before engaging in any excavation, construction, farming, or digging. Most states require two working-days' notice to the One-Call center to allow the utility companies to mark their pipelines and utilities at your proposed digging site. In fact, most serious damage done to pipelines is done when a third party inadvertently excavates, blasts, or drills within a pipeline right-of-way. By contacting the One-Call Center first, this type of damage can be prevented. Sometimes pipeline companies will require a representative to be present to monitor the safe excavation. One easy, FREE phone call to 811 starts the process to get your underground pipelines and utility lines marked. When you call 811 from anywhere in the country, your call will be routed to your state's One-Call Center. Once underground lines have been marked for your project, you will know the approximate location of your pipelines and utility lines and can dig safely. More information regarding 811 can be found at www.call811.com. State and federally regulated pipeline companies maintain Damage Prevention Programs. The purpose of these programs is to prevent damage to pipelines and facilities from excavation activities, such as digging, trenching, blasting, boring, tunneling, backfilling, or by any other digging activity. Utilities and pipelines are marked using the APWA Color Code System. Private lines, such as the natural gas service line after the meter or a home-owner's own installed gas line, are not marked by utility companies. Personnel from the pipeline or underground utility company themselves may come to perform the location of the underground facility. Outside utility locating services may be contracted by the companies to perform the actual work. 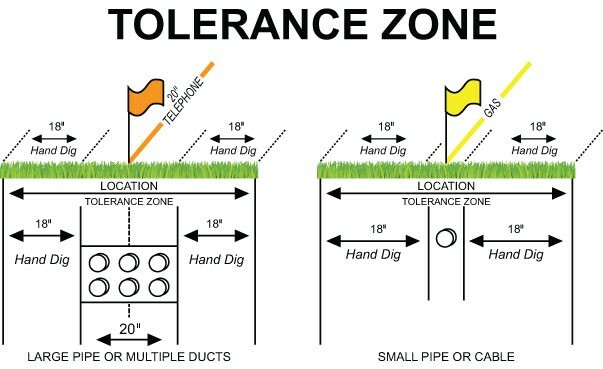 Tolerance zones are areas around underground utilities and pipelines where excavation with mechanized equipment is prohibited by state law. Pipeline companies sometimes require their presence in the event an excavator will be digging within the tolerance zone, or even within the right-of-way. Pipeline companies regularly patrol a right-of-way using aerial patrol, fixed wing aircraft, or other means. One of the purposes of these patrols is to identify encroachments, possible leaks, or other anomalies on their pipeline systems. If an encroachment is identified, the pipeline operator will dispatch field personnel to investigate and verify proper excavation practices are performed. Encroachments upon the pipeline right-of-way inhibit the pipeline operator’s ability to reduce the chance of third-party damage, provide right-of-way surveillance, perform routine maintenance and required federal/state inspections. In order to perform these critical activities, pipeline maintenance personnel must be able to easily and safely access the pipeline right-of-way, as well as areas on either side of the pipeline. Keeping trees, shrubs, buildings, fences, structures and any other encroachments well away from the pipeline ensures that the pipeline integrity and safety are maintained.